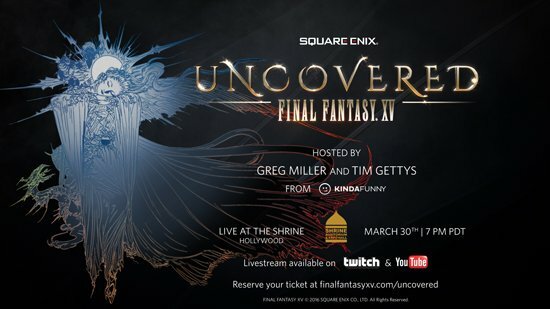 Square Enix will be hosting an event in Los Angeles on March 30th to finally reveal the release date for the long awaited Final Fantasy XV. The event will be hosted by Kinda Funny’s Greg Miller and Tim Gettys. It will be live streamed on both YouTube and Twitch so everyone will be able to experience it. The thought of finally having a release date for this game is rather surreal. This May marks the tenth anniversary of its initial announcement as Final Fantasy Versus XIII. It makes you wonder, can this game possibly live up to the hype it has received over the last ten years? I remain hopeful that it will. The Final Fantasy Series has been stagnant for years now and the XIII trilogy of games pretty much killed my love of the franchise. The Final Fantasy XV demo released alongside Final Fantasy Type-0 has kept me hopeful though, that this will be a return to form. It’s a shame that Square Enix lost sight of what the fans loved. Thankfully they seem to be hitting all the right notes as of late. A renewed focus on JRPG titles and the announcement of the Final Fantasy VII remake has a gone a long way in terms of renewing consumer support. However the companies actions over the next few years will show us if that support is warranted, they have to deliver on the promises they have made as of late. Final Fantasy XV will be available at some point in 2016 on PlayStation 4 and Xbox One. There are rumblings of a possible PC port but as of now there is no confirmation the port will be coming.